After I had translated Franz Irsigler’s article on how the Scharzhof came into private hands in the early 19th century, I studied the relevant legislation and visited various archives in order to find out more about Jakob Koch (Jacques Koch) and the Scharzhof transaction. I will make the case that the final price in cash of the Scharzhof and Mergen press house (the latter in Wiltingen) was just less than 6,000 francs, interest excluded, which is in line with Dean Schauffler’s Wiltingen parish chronicle. In a separate article, I will present some new findings about Jakob Koch’s and Anna Maria Clomes’s biographies. We know from Franz Irsigler’s article that Wiltingen and Kanzem had been part of the Duchy of Luxembourg since at least the 13th century. Both villages remained in the French Republic successor Department of Forêts, which was founded on October 1, 1795. When the French army invaded the Austrian Netherlands, which included the Duchy of Luxembourg, it was commanded by the Representatives of the People, which were like political commissioners. They were typically deputies of the National Convention (the parliament), normally with a degree in law, and were made responsible for the application of the Committee of Public Safety (the government) policy in the Austrian Netherlands. In its 50-article decree of November 9, 1794, the Representatives of the People at the Army of Sambre-et-Meuse, declared that property of any clerical organization whose administrative center (chef-lieu) was based outside the occupied territories was nationalized. The Luxembourg National Archives hold the minutes of the Forêts central administration. In a session held on February 23, 1796, the central administration rejected petitions from four Trier monasteries, among them St. Mary’s (Kloster St. Marien), to obtain full use (jouissance) of their properties situated in the said department. The sole ground for the rejection was the said decree of the Representatives of the People at the Army of Sambre-et-Meuse. This meant that the Scharzhof had now officially been nationalized and its auction was just a question of time until the procedures were put in place. In the autumn of 1796, two laws were passed which were instrumental for the sale of nationalized property in the newly created departments—then referred to as the Reunited Departments, les départements réunis. On September 1, 1796 (15 Fructidor, year 4), the Law on Dissolution of Religious Orders was adopted. Under this law, the monks and nuns were even forbidden to wear their religious habits, but at the same time, they were also given some rights. Article 11 stipulated that every member of the dissolved congregations was entitled to a pension capital of up to 15,000 francs. Under article 13 of the law, the capital was to be disbursed in a note (bon) when purchasing a nationalized property in the Reunited Departments. Further, the bons de retraite were not transferable to a third party (article 14). The first page of the auction protocol no. 295 in the Department of Forêts, with the reference to the law of 16 Brumaire of year 5. Archives nationales de Luxembourg, cote B-0340. Photo by Per Linder. A good two months later, a law was passed on the ordinary and extra ordinary expenses for the republican year 5 (Law of 16 Brumaire, year 5)—this was a sort of budget law (the republican year started on September 22). The second half of the law regulated the sale of nationalized property in the reunited departments. The official auction protocol referred explicitly to the law. The establishment of the opening bid (première offre, or première mise) was central to the auction procedure, since the buyers’ future cash payments and fees were based thereupon. Article 10 defined the opening bid as either three-quarters of the previous laws’ valuation, or 15 times the estimated yearly income. The payment, or rather the settlement, which was divided into two parts, was regulated in article 11. The first part consisted of cash payments: 1/20 of the opening bid was due ten days after the auction and another 1/20 after six months. Thereafter, further four-tenths of the opening bid were to be financed by four bonds (obligations) with maturities of one, two, three, and four years at five percent interest. The second part of the payment—i.e., the remainder up to the winning bid—was to be settled with deliveries to the Republic and/or notes issued by the authorities—not in cash. 35,000 francs to be set off by ministerial orders and instruments. The former members of the religious orders were faced with a dilemma—on the one hand, their orders had been dissolved and they were given notes to acquire property, and, on the other hand, they had taken vows of poverty. 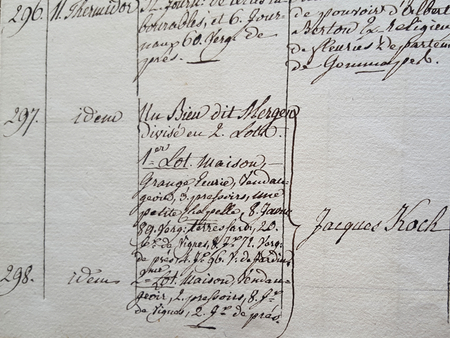 As per the historian of the Forêts, Alfred Lefort, the Roman Curia gave guidance in a decision in February 1797, which allowed the members of the orders to accept and use the notes, under the condition that they considered themselves as temporary owners, and the obligation to hand it back in the future. During the last 12 months of the French Directory, which ended with Napoleon Bonaparte’s coup of 18 Brumaire in November 1799, the republic was in even greater need for cash. Two laws were passed which called upon buyers of nationalized property to pay off every hundred francs of outstanding debt for two francs in cash. In other words, it was an offer to repurchase outstanding debt at a massive rebate. In the example from article 13 of the law of 16 Brumaire, year 5 above, this would mean 700 francs (2 x 35,000/100). So, a property with an opening bid of 30,000 francs, auctioned at 50,000 francs, could have been acquired for 15,700 francs in the end. For a holder of a bons de retrait, the outstanding non-cash debt would have been 20,000 francs (35,000 – 15,000 francs) and the repurchase sum 400 francs (2 x 20,000/100), and the total price would then have been 15,400 francs. His Holiness, in the interest of peace and the happy reestablishment of the Catholic religion, declares that neither he nor his successors will disturb in any manner the purchasers of the alienated ecclesiastical estates, and that, in consequence, the ownership of these same estates, the rights and revenues attached to them, shall be indefeasible in their hands and in those of their assigns. In other words, neither the Church nor any religious order, had any legal claims against buyers of their former property. 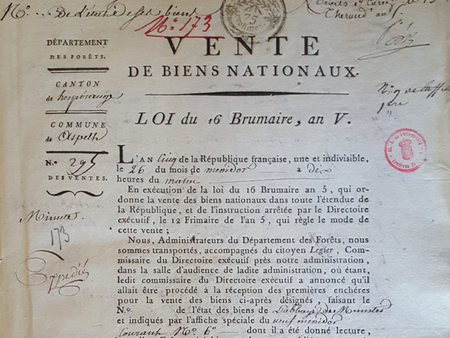 The auctions of nationalized property (adjudications de bien nationaux) in Forêts started in January 1797. In the first year, there were 772 auctions. In 1798, there were 882. In 1799, the activity was much lower with 188 auctions. By 1800, it was only 61. Alfred Lefort writes that 117 of the clergymen accepted the bons de retrait, while 112 refused. The Luxembourg National Archives hold the domain administration’s registry of fees. From there, we can establish that the opening bids for the Scharzhof (item no. 297) and the Mergen press house (item no. 298) were at 6,450 and 3,642 francs, respectively. From the book by Sauerwald and Wenzel, which Franz refers to, we know that Jakob Koch issued two bonds at 645 livres (which was on par with francs) each. This nominal amount fits the payment procedure as laid out above, since it is a tenth of the opening bid for the Scharzhof: 6,450 francs.